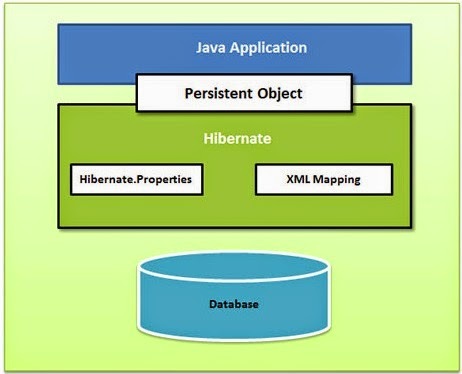 Hibernate is an Object-Relational Mapping(ORM) solution for JAVA and it raised as an open source persistent framework . · Hibernate takes care of mapping Java classes to database tables. · Provides simple APIs for storing and retrieving Java objects directly to and from the database. · Abstract away the unfamiliar SQL types and provide us to work around familiar Java Objects. · Manipulates Complex associations of objects of your database. · Minimize database access with smart fetching strategies. · Provides Simple querying of data. The Hibernate architecture is layered to keep you isolated from having to know the underlying APIs. 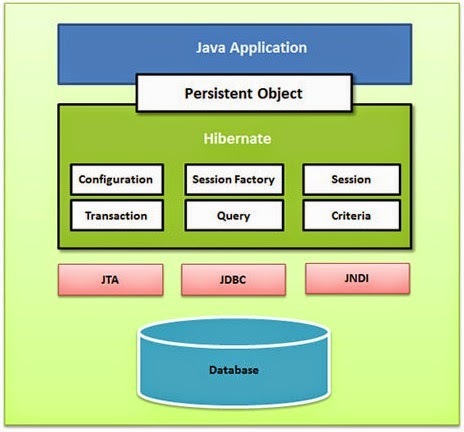 Hibernate makes use of the database and configuration data to provide persistence services (and persistent objects) to the application. Following is a very high level view of the Hibernate Application Architecture. Hibernate uses various existing Java APIs, like JDBC, Java Transaction API(JTA), and Java Naming and Directory Interface (JNDI). JDBC provides a rudimentary level of abstraction of functionality common to relational databases, allowing almost any database with a JDBC driver to be supported by Hibernate. JNDI and JTA allow Hibernate to be integrated with J2EE application servers. Following section gives brief description of each of the class objects involved in Hibernate Application Architecture. · Database Connection: This is handled through one or more configuration files supported by Hibernate. These files are hibernate.properties and hibernate.cfg.xml. · Class Mapping Setup. This is achieved by using hbm.xml file or by Annotations. Configuration object is used to create a SessionFactory object which intern configures Hibernate for the application using the supplied configuration file and allows for a Session object to be instantiated. The SessionFactory is a thread safe object and used by all the threads of an application. Using hibernate, if we want to put relationship between two entities [objects of two pojo classes], then in the database tables, there must exist foreign key relationship, we call it as Referential integrity. A one-to-one relationship occurs when one entity is related to exactly one occurrence in another entity. It is a type of relationship in which each record in one table is linked to multiple records in another table. It is a logical data relationship in which the value of one data element can exist in combination with many values of another data element, and vice versa. This annotations is used to mark a class as an Entity bean. By default, the @Id annotation will automatically determine the most appropriate primary key generation strategy to be used but you can override this by applying the @GeneratedValue annotation which takes two parameters strategy and generator. Preferred way is to use only default the default key generation strategy. Letting Hibernate determine which generator type to use makes your code portable between different databases. · name attribute permits the name of the column to be explicitly specified. · length attribute permits the size of the column used to map a value particularly for a String value. · nullable attribute permits the column to be marked NOT NULL when the schema is generated. · unique attribute permits the column to be marked as containing only unique values.